Within the limitations of the small-sized format of the Oakwood Press marque, (15 x 21 cm), the author had done a most competent job of describing this line. The quality of some of the photos is dubious in places, although the majority (and there are lots of them) are fine, while the rarity of images of the subjects chosen excuses the inclusion of some of lesser quality because most of what is illustrated is now long gone! The inclusion of several working timetables is to be applauded, while the lack of images of pre-WW2 trains is unfortunate, but you can't publish what isn't available. There are however, sufficient images of early and GWR trains to be able to form a reasonable idea of what standard services looked like, although the lack of variety in these means one has to look elsewhere to find details of the make-up of many trains on this most interesting GWR branch. The Minehead branch is, generally speaking, an ideal subject for the modeller with a lack of space as it had mainly (but not entirely) prairie tank engines hauling 2-4 coach trains for much of its life, with a variety of through coaches from various places included much of the week, and for those with a bit more space, there was the odd rather longer through train on summer Fridays and Saturdays, also hauled by small, and sometimes tender, engines. (The small turntable at Minehead was limited to a Mogul or Bulldog, and only then by using extension bars, for lack of space precluded fitting anything larger in GWR or BR days.) These services lasted long enough to be provided by DMUs and class NB D63xx diesels, followed by Hymeks, before closure and reopening as the now-famous 'Heritage' railway. 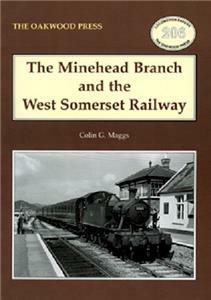 Photographic coverage of the line in its BR period is, as is often the case, is excellent however, and with much of the stock seen in those photos available RTR in the smaller scales, this line is well worth a study - this book should form a vital part of any such endeavour and is therefore heartily recommended.